Anyway, a good price doesn’t solve the problem of what to do with Belgian endive. 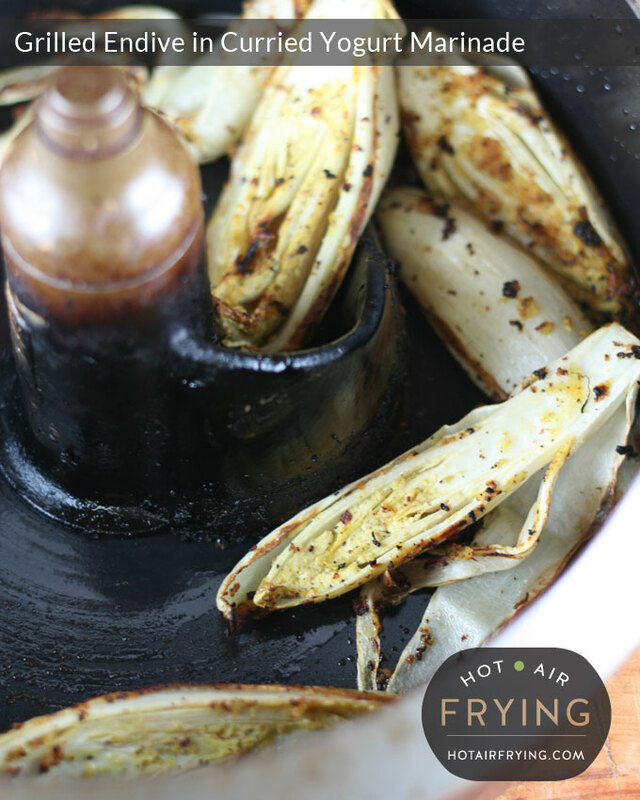 But, this air frying recipe for it does, and it’s dead-easy to boot. This is not a “fill you up” vegetable side dish; it’s more of an accompaniment side of the plate kind of thing to provide a sophisticated flavour burst to the rest of the plate. I would say the flavour is like very, very mild cabbage with a very subtle, white wine kind of tang to it. 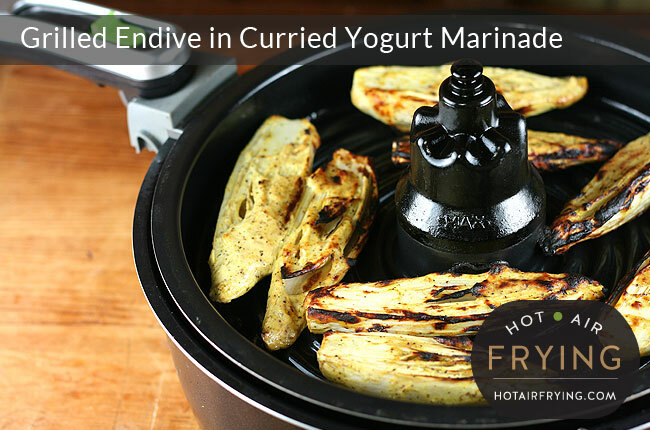 You can make this either in a basket-type hot air fryer or in a paddle-type. Recipe first, then photos and discussion later. 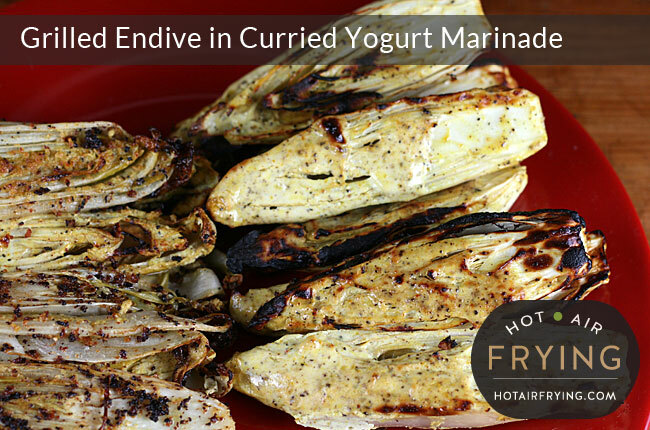 A delicious, easy and healthy way to add Belgian endive to your repertoire. Wash then halve the endives lengthwise through the root end, set aside. 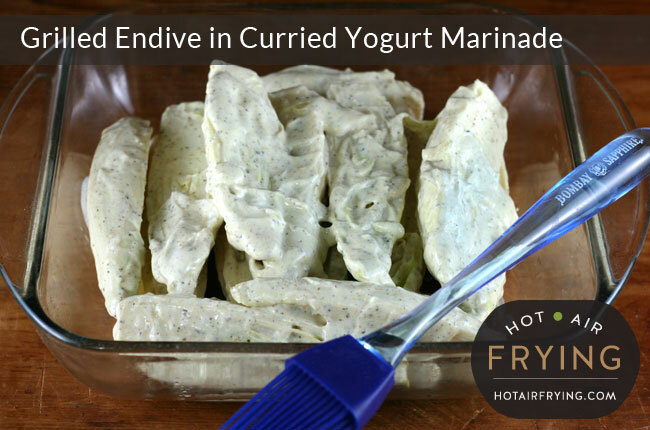 Either toss the endive halves in the marinade (a clean pair of hands works best) or brush them all over with it. 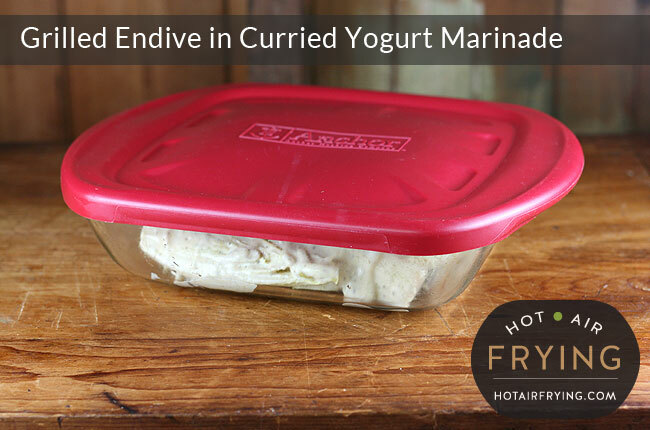 Cover and let marinate refrigerated for at least 30 minutes, but up to a day ahead is fine. Cook for 10 minutes (see note below). BASKET-TYPE: If cooking in a basket type air fryer, or an Actifry™ snack basket, spray the basket and cook for 10 minutes. It doesn't matter what side is up or down. 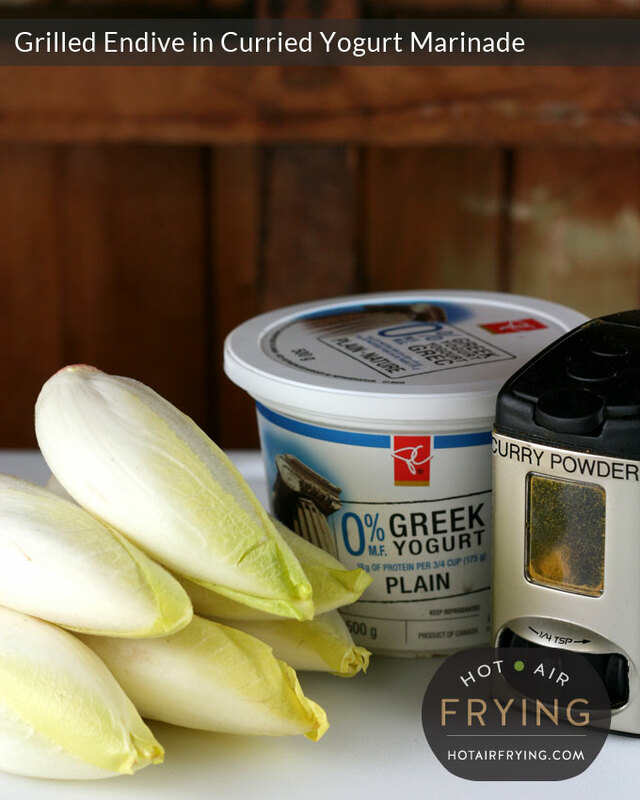 ACTIFRY 2 IN 1: If cooking on the grill pan of a 2 in 1 Actifry™, spray the pan and cook for 10 minutes. It doesn't matter what side is up or down. Instead of the garlic powder, you can use 2 fresh cloves of garlic, minced. 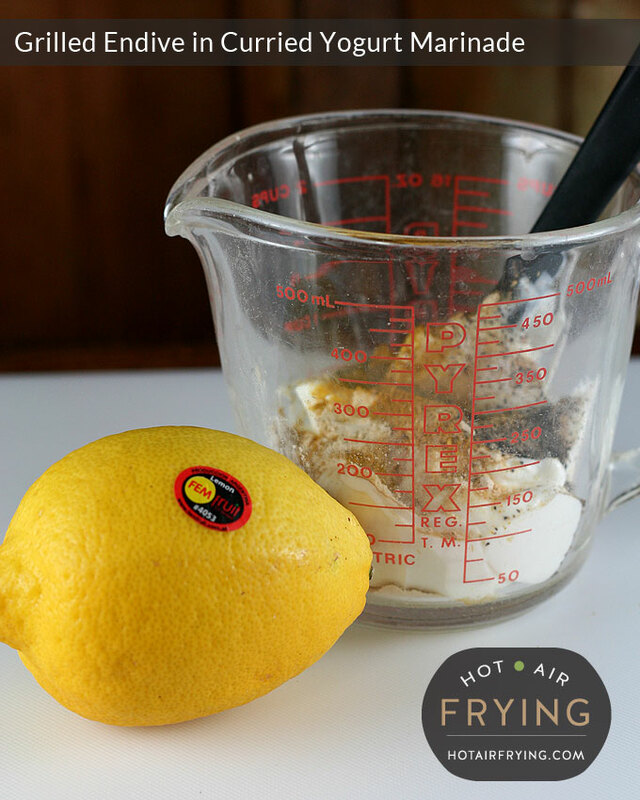 Instead of the lemon juice, you use water or vinegar. Instead of the curry powder mix, you can put together your own curry mix. I used Greek yoghurt for this particular photo session, as that is what was on sale (and therefore in the house! ), but actually a thinner, regular yoghurt can be easier to work with. But you do definitely want plain flavoured, not vanilla or fruit-flavoured . 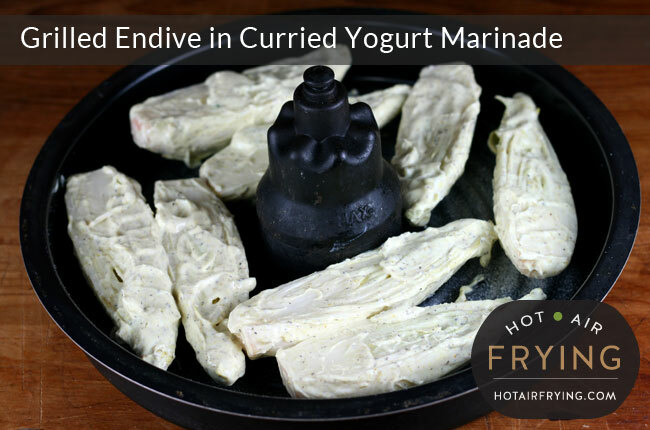 You should feel free to play with the flavouring of the yoghurt marinade. In fact, I’m tempted to try something other than the curry flavouring one day, but it’s just that the curry flavouring works so darn well with this for some weird reason. 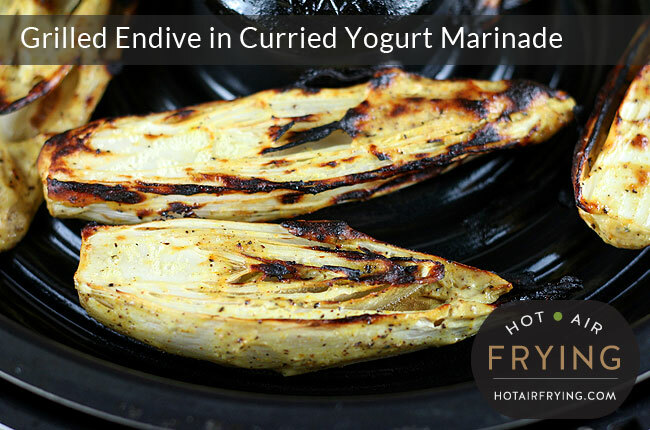 If your marinade works out to be thick, don’t worry, you can just brush it on: use the brush to push it down into the nooks and crannies of the endive heads. 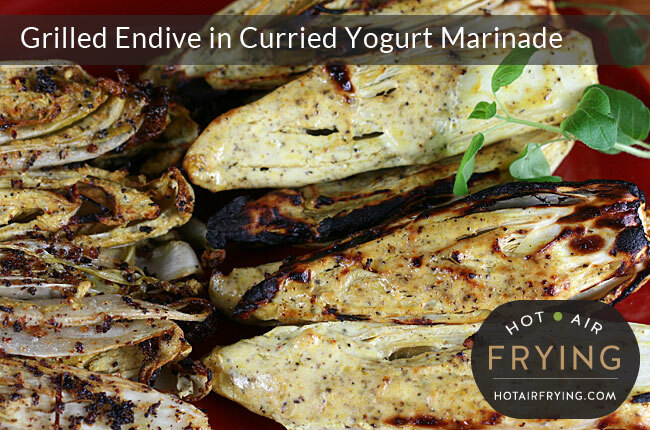 Cover it, and let the marinade do its work, enhancing the subtle tang of the endive leaves. At this point, you could even stick it in the fridge for cooking the next day. If you do, I’d just take it out of the fridge 30 minutes before cooking to warm up a bit. Above, I’ve arranged a batch in the top grill pan of an Actifry 2 in 1. All the halves won’t fit in one go into this, or the basket of a basket-type fryer either, so don’t try to force it. Just cook them in two batches, it’s so quick to cook anyway. There they are, all cooked up. These are super high in taste and very succulent. Here above is a photo of a batch cooked in the bowl of a paddle-type air fryer. They look a little different of course, but if anything, they taste just a lil better even: they are a bit softer and the flavour is more developed. One or two leaves might come loose from the head, but it’s not the end of the world. P.S. 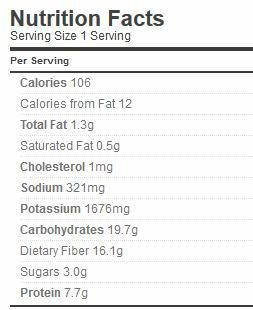 I tried this recipe in a Philips AirFryer™ (160 C, for 40 minutes, tossing every 10 minutes) but it was not successful. They did not soften, and started to dry out and burn. YIELD: 6 servings of 2 halves (50 g / 1.75 oz) each. Nutrition is a little different if you cook in bowl with a teaspoon of oil, but not enough that you’d want to put out an All-points Bulletin.